They are kind, they are passionate, they are HILARIOUS. They don’t sweat the small stuff. They are the kind of people that light up a room and make every event they attend a little more lively. We are lucky to know these two and call them friends. Their wedding ceremony at Sacred Heart Catholic Church was beautiful, and we’ll never forget Mikey’s face when saw his bride walking toward him. Their reception at Longleaf Botanical Gardens in Anniston, Alabama was such a party with every single guest busting a move on the dance floor! Congrats, Mr. and Mrs. Kline! We love you guys! P.S. Chips and margs double date soon, please! 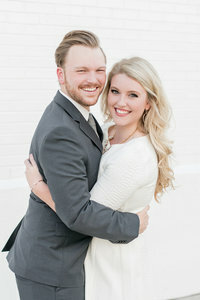 Be sure to check out KK & Mikey’s gorgeous Railroad Park engagement session here!